Big sessile organisms like plants and fungi and small organisms whose motility can't move them that far, like bacteria and protists, have no option but to function in the environment they are found in. For photosynthetic organisms it has been adaptive for them to develop mechanisms to sense their light environment, and adjust their form and metabolism to optimize their performance under their local conditions. Since light environments change, these organisms have also developed the ability to continuously adjust their function to current conditions. Taken together these responses to light constitute the phenomenon known as photomorphogenesis. The definition of photomorphogenesis, as applied in this module, is any change in form or function of an organism occurring in response to changes in the light environment. Photomorphogenesis is often defined as light-regulated plant development (Figure 1), but there are also changes in morphology and/or cell structure and function, which occur as transient acclimatizations to a changing environment, which are also light regulated. Particularly if this more inclusive definition is used, photomorphogenesis is a process common to organisms well beyond the plant kingdom. While there may be only a few examples of photomorphogenesis in the animal kingdom, it is a common feature of development in fungi, protists, and bacteria, as well as plants. While this module will focus on what is known from studies of plant photomorphogenesis, there will be selected examples from other kingdoms. Figure 1. Photomorphogenesis as a morphological and as a cellular process. The left photos show the change in form of an Arabidopsis thaliana seedling grown in darkness (top) or in white light. The right hand illustration shows the change in chloroplast structure and diagrams the progress of light signals through two receptor systems, cryptochrome and phytochrome. Adapted from Biochemistry and Molecular Biology of Plants, (c) American Society of Plant Biologists, with permission. Photomorphogenesis is an organismal response to information present in the light environment. There is information concerning: simple presence of light, light direction, light intensity, light duration, spectral quality and polarization (see Mougeotia: A Chloroplast with a Twist, for a description of the last phenomenon). Studies have demonstrated photomorphogenic effects of all of these parameters of the light environment in diverse organisms. However, it must be acknowledged that the responses to polarization were observed in laboratory conditions that may not have any parallel in the natural light environment. It should also be noted that the earliest responses to light exhibited by germinating seedlings are initiated by the mere presence (or absence) of light, information of the simplest sort possible. It would be impossible to provide a comprehensive catalog of photomorphogenic processes, and it would not serve any particularly useful purpose. The brief list below is an illustration of the diversity of organisms and processes falling within the realm of photomorphogenesis. All of the processes listed entail the coordinated regulation of several to many developmental events at the cellular and (where relevant) organism level. Figure 2. 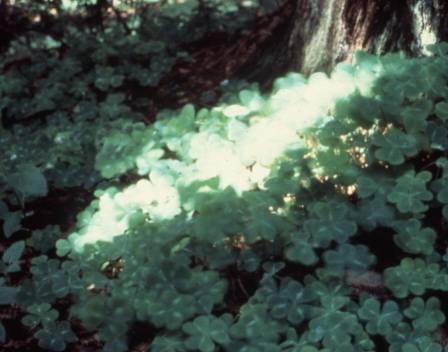 A sunfleck in a patch of Oxalis oregana. A gap in the shade exposes this forest floor herb to full sunlight. The fleck will move across the plants as the sun moves, causing the plants to experience two widely different light environments on a short time scale (minutes). Photograph courtesy of Dr. Olle Bjorkman. The processes of photomorphogenesis integrate and respond to information about the light environment in parallel with the time scales of the changes described. The photosensory systems used in photomorphogenesis can couple the absorption of photons to visible responses within seconds, as in the case of phototropism in the fungus Phycomyces, or light signals can be integrated over days, as in most cases of photoperiodic induction of flowering. The responses to light can be dynamic and reversible, particularly in the case of unicellular organisms, or they can be permanent changes in form. Two different types of phototropism, first described by Charles and Francis Darwin (Darwin and Darwin, 1880), illustrate this distinction. The form the Darwins described as heliotropism, now conventionally thought of as phototropism, is a permanent differential growth towards light. The orientation of leaves that places their blades at right angles to incident light, which the Darwins called diaheliotropism, and which is now referred to as solar tracking, results from reversible differences in hydrostatic pressure in cells at the base of the leaf. (see "Sunflower Solar Tracking" video on Plants in Motion, Hangarter, 2000) Phototropism leaves a permanently altered stem structure, the classic example being elongated cells in a grass or dicot seedling stem (see "Phototropism" videos on Plants in Motion, Hangarter, 2000). Conversely solar tracking movements in leaves [studied principally in the Fabaceae (legumes), and Malvaceae (mallows)] are achieved by changes in the hydrostatic pressure (turgor) in cells supporting the leaves (Koller, 1990). These changes are repeated daily with no plastic change in the leaf base. Given the diversity of types of information sensed concerning the light environment, the diversity of organisms exhibiting some type of photomorphogenic response to light, and the diversity of possible responses, it is not surprising that there are several classes of photoreceptors used to sense the light environment at the molecular level (Devlin et al., 2007). At the same time plant photoreceptors parallel those of animals in being limited to an unexpectedly small range of types of molecules. At first examination, the plant photoreceptors separate in to just two main groups: sensors that have absorption maxima and transduce responses to light principally in the red region of the spectrum, and sensors that have absorption maxima in the blue/UV-A region (Franklin et al., 2005). The reasons for the specializations of photoreceptors for these regions of the visible spectrum relate to the kinds of information available in the daylight spectrum, and how it can be used. In terrestrial environments, the absorption of light by chlorophyll shifts the light transmitted through canopies to longer wavelengths, so this spectral region is important for sensing light quality. Blue light remains a reliable indicator of sunlight, and because it is more subject to scattering, gradients of light intensity can be set up within relatively short distances across tissues and even large cells, providing a mechanism for sensing light direction. In aquatic environments blue light sensing takes on even greater importance, because of the absorption of red light by water. The red light sensing photoreceptors, the phytochromes, are a single family of proteins with amino acid sequence homology spanning from cyanobacteria to non-photosynthetic bacteria to plants. All use similar chromophores (one of 3 bilitrienes similar to a heme; (Burgie and Vierstra 2014)), and share other aspects of structure, function and signal transduction. Phytochromes are the dominant contributors to the sensing of light quality in plants, and also participate in the sensing of light presence, intensity and duration, and to a lesser extent light direction. The blue light sensors are a diverse group of molecules performing similar functions in different contexts (Lin, 2002), so instead of a family of related molecules they more closely correspond to a guild. Some blue light responses can be induced by both blue and UV-A light, while others are responsive to only blue light. Different photomorphogenic responses to the same spectral region exhibit action spectra with different peaks and fine structure. Two distinct guild members use flavin/pterrin chromophores, while a third sensor is a carotenoid. One sensor functions principally in phototropism, another in sensing light quality and duration, and a third, light intensity in specific cells. These photoreceptors have been identified in seed plants by a combination of genetic and biochemical studies. There are responses in protists, fungi, green algae and ferns that exhibit a similar action spectra to the seed plant responses, but for which the identity of the photoreceptor has not been as rigorously established. The phytochrome family of photoreceptors has an unusual feature that was a significant advantage in the study of the phytochrome regulation of photomorphogenesis, and the purification and characterization of the photoreceptor itself. The chromophore for phytochrome is photochromic, i.e., it undergoes a change in conformation that makes a stable change in its light absorption properties. When the chromophore is in one state, the phytochrome molecule is inactive, and when it is in the other state the phytochrome molecule initiates what are to this point poorly understood signaling processes. Phytochromes are synthesized in the inactive form, for which the absorption maximum is 660 nm. The red absorbing form, Pr, on absorption of a photon, converts to a form with an absorption maximum of 730 nm, Pfr (far red). The Pfr from is the active form, but it can be converted back to Pr (and inactivated) by the absorption of a far-red photon (Figures 3 and 4). Figure 3. Diagram of interconversion of the Pr and Pfr forms of phytochrome. Figure 4. Absorption spectra for the 2 forms of phytochrome shown in figure 3. Adapted from Biochemistry and Molecular Biology of Plants, (c) American Society of Plant Biologists, with permission. The photoreversibility of the activation of phytochrome has been a valuable tool in testing for phytochrome regulation of specific aspects of photomorphogenesis. The different absorption properties of the two molecules also made it possible to purify the protein. Phytochromes turned out to be large multi-domain proteins, and the functions of these domains, and how the protein interacts with signaling partners have yet to be anywhere near fully explored. The sensitivity of phytochromes to red and far-red light makes this class of photoreceptor ideally suited for the sensing of shade in the terrestrial environment. Chlorophyllous leaves absorb most of the visible light spectrum, but are transparent in the far-red. Far-red light enriched shade light shifts the equilibrium between the Pr and Pfr forms significantly towards Pr. The inactivation leads to the inhibition of seed germination in plants that normally thrive only in high light. When mature plants respond to shade, the loss of the Pfr signal, which inhibits stem elongation and stimulates leaf development, leads to increased height and limited allocation of resources to leaves until the shade condition has been overcome. A fascinating sidelight to the shade avoidance response is that there is enough far-red light scattered from neighboring plants to shift the equilibrium towards Pr even before a plant is overtopped by its neighbors, so the phytochrome system senses shade even before it occurs (Ballaré et al.,1994). The interconvertability of the two forms of phytochrome is an important feature for sensing light intensity as well. In any natural light environment there will be photons of wavelengths that can be absorbed by each of the two forms of phytochrome. This results in individual molecules of phytochrome cycling between the two forms. It has been found that the cycling rate can be influenced by light intensity, and that cycling rate is converted to a signal regulating developmental adaptations to different light intensities. Sensing low levels of light, as little as the few photons that filter through several centimeters of soil, is another function carried out by the phytochrome system. The developmental program that follows germination is "de-etiolation", the conversion from a below ground growth form characterized by high stem elongation rates, little or no leaf expansion and no chloroplast development to the growth form of a conventional mature plant. Seedlings de-etiolate in response to light through a coordinated set of developmental changes in stem and leaf morphology, paralleled by the establishment of the biochemistry required for photosynthesis. The high sensitivity to light allows this process to begin even before the seedling breaks through the soil. (see Awakened by a Flash of Sunlight). There is nothing special about the efficiency of photon absorption by phytochrome, but plants produce one form of the molecule (the A-type phytochrome; see below) at extremely high levels, and it takes only a very small percentage of this population being converted to the Pr form to begin de-etiolation. This is the response described in the introduction as a response to the simple presence of light. Physiological evidence first revealed that the stability of phytochromes Physiological evidence first revealed that the stability of phytochromes differed in dark and light-grown tissues. Along with other evidence, this indicated the existence of two pools of Pfr, a labile pool and a stable pool; pools that have since been found to represent different molecular species of phytochromes. Evidence of distinct types of phytochromes has been provided by the cloning and sequencing of five genes from Arabidopsis (designated PHYA through PHYE) that encode phytochromes A through E. The amino acid sequences of PHYA, PHYB, and PHYC are equally divergent and demonstrate about 50% homology to each other. Mutant analysis has revealed some of the separate functions performed by the various phytochromes. The cucumber lh mutant and the Arabidopsis hy3 mutant, which grow taller than wild-type plants in white light, are deficient in PHYB. The aurea mutant of tomato is deficient in PHYA, and has been used to dissect the phytochrome response. A recent mutant screen has identified PHYC mutants in Arabidopsis, and phenotypic analysis of a PHYD mutant in one Arabidopsis ecotype indicates that PHYD regulates several of the same responses as PHYB. Phytochrome responses can be characterized by both the amount of light required to activate them. The Box Figure (below) illustrates the separation of phytochrome responses into 3 types based on the quantity and duration of the light treatment needed to induce them. 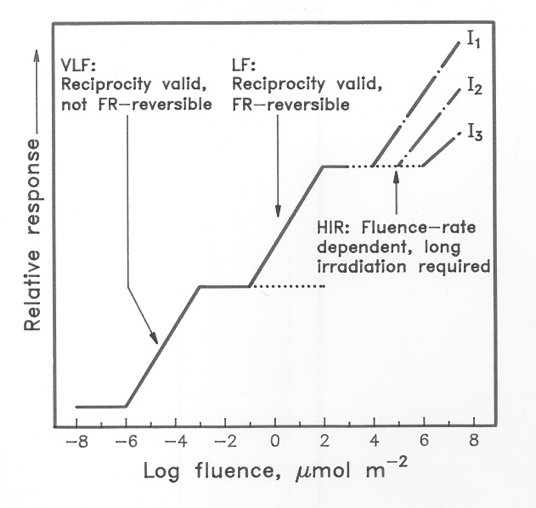 The two responses labeled VLF (Very Low Fluence) and LF (Low Fluence) are described as "induction" responses to indicate that they are induced by a short pulse of light, following which plants/seeds can be returned to darkness. Common induction responses include seed germination seedling stem elongation. The VLF response can be activated by short pulses of very weak light. A rough calculation was made that a VLF response can be induced by 1-3 firefly flashes. The LF response is the classical low fluence red/far-red reversible phenomenon. At first it might seem a surprise that the VLF response does not show the photoreversibility normally associated with phytochrome mediated responses, but this can be understood once it is appreciated just how few molecules of Pfr are needed, so few that even far-red light produces enough (Note overlapping absorption spectra in Figure 4). Mutational investigations on seedlings deficient in phytochromes clearly implicate PHYA as the regulator. Mutational studies have implicated PHYB as the prime regulator of LF response. The high irradiance reaction (HIR) requires continuous or prolonged irradiation with high-intensity light. The response in this case is proportional to the irradiance received by the plant; again, photoreversibility is absent. Typical HIR responses are anthocyanin synthesis or inhibition of hypocotyl elongation. Although phytochromes clearly are involved in these responses, evidence indicates that other photoreceptors that absorb UV or blue light contribute to this control. Box Figure. Three phytochrome mediated responses regulated by different amounts of light. See the text above. A powerful but labor intensive experimental approach to identifying the roles of the individual phytochromes has been the creation of mutations in each of the phytochromes, then crossing individuals with single mutations to create plants with progressively fewer and fewer functional phytochromes. This is discussed in detail in the module on Photoreceptor Mutants. The results of these studies have revealed that there are significant redundancies among the roles for each phytochrome, and even that the regulatory effects of one phytochrome can be in the opposite direction from those of another member of the family (Josse et al., 2008). Redundancies and cross-talk with the cryptochrome family of blue light receptors (see below) have also been found. A major surprise has emerged as the complete sequences of a variety of bacterial genomes became available. Genes with significant homology to the plant phytochrome genes were found in several species. This was not so surprising in the case of the cyanobacteria. The sensing of differences in light spectral quality involved in complementary chromatic adaptation has points in common with sensing of shade in plants. However, finding that there are sequence similarities suggesting a common evolutionary origin of the procaryotic and eucaryotic photosensors was unexpected. More unexpected was the discovery of a phytochrome like gene and corresponding protein in the non-photosynthetic bacterium, Deinococcus radiodurans, followed by a raft of other diverse bacteria (Hughes and Lamparter, 1999). A significant benefit of these discoveries has been that the similarities and differences between the procaryotic and eucaryotic proteins have contributed to understanding how changes in the phytochrome molecule are recognized and converted into responses. Another dimension to making sense of the diversity of responses mediated by multiple phytochrmomes has been the discovery of a family of proteins that interact with phytochrome proteins to transduce responses: the Phytochrome Interacting Factors (PIFs). Eight or more of these proteins make up a family of transcription factors that interact exclusively with the Pfr form of phytochormomes (Leviar and Monte 2014). PIFs are themselves part of a broader network of transcription factors that influence responses to multiple environmental signals. None of the blue light regulated responses exhibit the photoreversibility seen in the phytochrome system. It has turned out that none of the blue light photoreceptors found thus far are photochromic, and this has meant that their identification has been more difficult. 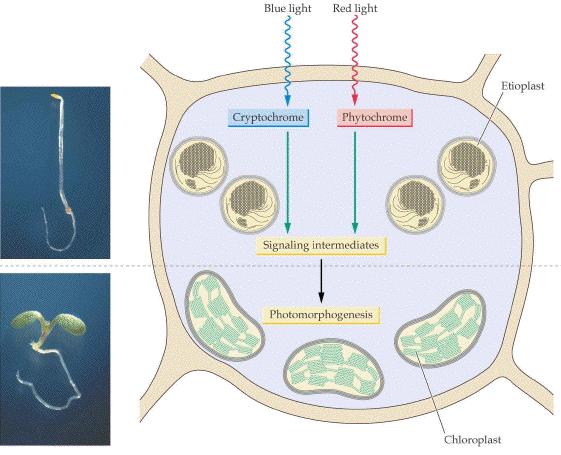 The cryptochromes were the first blue light sensors characterized, and their discovery was based on the screening of mutant Arabidopsis plants for defects in photomorphogenesis in response to blue light. When the DNA sequence for cryptochrome 1 was obtained, it was found that there was significant homology to another class of light absorbing protein, the DNA photolyases involved in DNA repair (see module on Photoreactivation). Both cryptochromes and photolyases have the same pair of chromophores, a pterin/deazaflavin and flavine adenine dinucleotide, but the chemistry that occurs after light absorption is quite different. 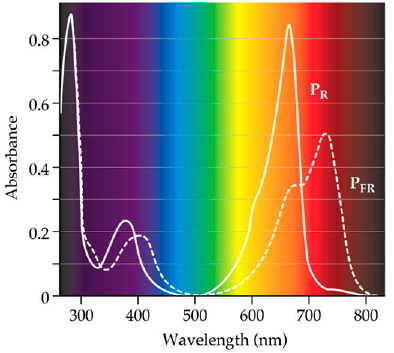 The absorption spectrum of cryptochrome corresponds to the action spectrum of one class of blue light mediated photomorphogenic responses. Cryptochromes mediate blue-light responsive components of de-etiolation, most of which require relatively high intensities of light. Hence they act as sensors of both light quality and light intensity. When plants with defects in both cryptochromes and phytochromes are created by genetic crosses, the results indicate both overlaps and coordination of regulation of de-etiolation by these two systems. The cryptochromes are not the primary sensors for light direction in phototropic responses (see the section on Phototropins, below), but they may modulate these responses. Cryptochrome 2 is also involved in the photoperiodic regulation of flowering, and thus is a sensor for light duration. The involvement of cryptochrome in circadian rhythms extends all the way to the animal kingdom. A protein with DNA sequence homology to the cryptochromes has been found to act as a photosensor in the Drosophila circadian clock, and another protein with homology to cryptochrome has been found to be a signaling intermediate in the mouse circadian system. Blue Light Sensing in Plants. One of the genes that, when mutated, conferred a non-phototropic phenotype has been identified as the light sensor phototropin. The protein product of this gene has two flavin mononucleotide chromophores. The absorption spectrum for phototropin is consistent with the action spectrum for phototropism, and the molecule has been shown to be differentially activated in parallel with the light gradient created across a stem irradiated from one side. After the first phototropin (phototropin 1) was identified as the sensor for phototropism, a second phototropin was found, and it appears to regulate phototropic responses to high light intensities and chloroplast movements. Phototropin 2 mediates both the accumulation of chloroplasts to optimize light absorption under low light intensities, and movements to minimize light interception under high light intensities. Like the phytochrome and cryptochrome systems, it turned out that there is redundancy between the two phototropins, and phototropin 1 will replace phototropin 2 in the chloroplast accumulation response, but not the chloroplast avoidance response. This chloroplast movement response is difficult to classify in the general scheme of photomorphogenesis. The chloroplasts can be seen as exhibiting phototaxis, and hence the response is a response to light direction (and hence is also discussed in the module on Basic Photomovement), while from the organismal point of view the response is an optimization of photosynthesis in response to changing light intensity. Both phototropins are also regulators of the very rapid (2-5 min lag time) inhibition of stem elongation in dicots. This growth response is independent from the differential growth that occurs in phototropism, and involves changes in membrane potential and calcium fluxes as intermediates. The availability of mutants defective in both the cryptochromes and phototropins led to the discovery that the blue-light regulation of stomatal aperture (see the module on Basic Photosynthesis) was mediated by neither the cryptochromes nor the phototropins. However, a specific mutation in carotenoid biosynthesis does cause a loss of blue light regulation. The formation of the xanthophyll zeaxanthin correlates with stomatal aperture, and the action spectrum for the reaction driving the synthesis of this carotenoid matches the action spectrum for blue light induced stomatal opening (Folta and Maruhnich, 2007; see also the module on Basic Photomovement, and the essay, The Blue-Green Reversibility of the Blue-Light Response of Stomata ). Likewise there is an action spectrum for the folding of the leaf base in Oxalis in response to high intensity blue light (a light avoidance response for a forest floor plant), but it does not match any known photoreceptor. This response has properties in common with the solar tracking movements described at the beginning of this module. In both of these cases, there are no mutants readily available to investigate whether these responses are regulated by any of the known photoreceptors. There are a constellation of plant adaptations to UV-B light, and there is ample documentation that these responses are signaling mediated rather than caused by non-specific damage (Jansen et al., 1998; see also the module on Ultraviolet Effects on Phytoplantkton). Some of these responses have action spectra that implicate a specific receptor. This receptor has recently been identified as the protein coded for by the Ultraviolet Resistance gene 8 (UVR8: see Photomorphogenic Responses of Plants to UV-B Radiation, and Jenkins (2014). UVR8 has been found to mediate UV-B induced photomorphogeneis including modulation of biosynthetic pathways, photosynthetic performance, morphogenesis, and responses to pathogens principally in mature light-grown plants. UVR8 is almost certainly not the only photoreceptor for UV-B radiation. Evidence indicates UVR8 does not to regulate responses in dark-grown Arabidopsis seedlings (Gardner et. al 2011). Other responses to UVB have action spectra that correspond to the action spectrum for DNA damage. These latter responses retain characteristics of photomorphogenic developmental programs. Given that studies of DNA repair have now provided ample evidence that there are signal transduction pathways activated by DNA lesions (McGowan and Russell, 2004), it is not unreasonable to consider DNA as a possible photoreceptor. Indeed, Biever et al. (2014) have provided evidence that thymidine dimer formation is an essential step in the regulation of hypocotyl growth in dark grown seedlings. In the last decade it has been found that green light has effects that cannot be accounted for based on the known photoreceptors (Folta and Maruhnich, 2007). In particular, there are effects on early hypocotyl elongation and the closing of the pinnules of compound leaves in Albizzia julibrissin. There are also green light-induced changes in mRNA transcripts found in developing plastids. Other green light effects, such as stomatal closure, have been traced to the carotenoid system described above. Cryptochromes mediate green light effects on flowering time, and by an as yet unknown mechanism, phototropins transduce phototropic responses to green light. A flurry of activity has occurred as new opsin type photoreceptors have been found in a variety of unicellular algae. Rhodopsin mediated responses in unicellular algae such as Chlamydomonas have been known for some time (Harz and Hegemann, 1991). Unlike most animal rhodopsins, these photoreceptors function as independent ion channels. Discoveries of new channel rhodopsins have fueled the development of tools in the field of optogenetics, particularly relevant to manipulating electrical signaling in neurons (Fenno et al., 2011). The recent discovery of anion channel rhodopsins (Govorunova et al. 2015) has added new tools, but also indicated that there are yet more photosensors to be discovered. There are clearly a wide range of photomorphogenic responses, such as blue light induced leaf movements, several responses to green light, and an important fraction of responses to UV-B where the photoreceptor carrying out the conversion of a light signal into biological information is not known. Equally important, for none of the photoreceptors identified is it clear how the event of photoreception is transduced into a biological response, or even who the immediate signal transduction partners/targets of the photoreceptors are. The basic science inquiries are underway to obtain this information. There are also practical applications of the knowledge of the action of photoreceptors on developmental processes throughout the life of the plant. Very few plants if any evolved to grow in the light environment of a densely planted field, monoculture or otherwise. The normal photomorphogenic responses to these conditions lead to growth forms that are not necessarily the most productive. For example, dense stands of grasses will produce a light environment with high levels of far red light. This environment stimulates shade avoidance responses, which cause grasses to grow over tall, and "lodge" or collapse onto each other. The selection of cultivars with limited shade avoidance responses could ameliorate this problem. Therefore, it appears possible that modification of innate photomorphogenic programs, either by conventional breeding, or by the creation of transgenic plants, may create growth forms better suited to the needs and limitations of agricultural practice. Another practical application is the aforementioned area of optogenetics. Each of the photoreceptors cataloged here has unique properties that may suit that protein to a particular application. Hence new basic research discoveries could come as fast as solutions to agricultural challenges. Biever JJ, Brinkman D Gardner G (2014) UV-B inhibition of hypocotyl growth in etiolated Arabidopsis thaliana seedlings is a consequence of cell cycle arrest initiated by photodimer accumulation. J. Exp. Bot. 65: 11 2949-2961. Briggs WR, Christie JM. (2002) Phototropins 1 and 2: versatile plant blue-light receptors. Trends in Plant Science 7:204-210. Burgie, ES, Vierstra RD (2014) Phytochromes: An Atomic Perspective on Photoactivation and Signaling. The Plant Cell 26, 4568-4583. Darwin C, Darwin F. (1880) The Power of Movement in Plants. Appleton and Company, New York. Fenno L, Yizhar O, Deisseroth K (2011) The Development and Application of Optogentics. Ann. Rev. Neurosci. 34: 389-412. Franklin KA, Larner, JS, Whitelam GC (2005) The signal transducing photoreceptors of plants. Int. J. Dev. Biol. 49: 653-664. Govorunova, EG Sineschchekov OA, Janz R, X Liu Spudich JL (2015) Natural light-gated anion channels: A family of microbial rhodopsins for advanced optogenetics. Science 349: 647-650. Harz H, Hegemann P (1991) Rhodopsin-regulated calcium currents in Chlamydomonas, Nature 351: 489. Jenkins GI (2014) The UV-B Photoreceptor UVR8: From Structure to Physiology. The Plant Cell, 26: 21-37. Leviar P, Monte E (2014) PIFs: Systems Integrators in Plant Development. The Plant Cell 26: 56-78. McGowan CH, Russell P (2004) The DNA damage response: sensing and signaling. Curr Opin Cell Biol. 16:629-33.